The course addresses suicide among physicians and includes a 45-minute lecture on how to prevent veteran suicide. Note: this is not a train-the-trainer program. The institute offers a train-the-trainer program for the Level II QPR Suicide Triage training course embedded in this course, and for the Level III QPRT Suicide Risk Management Training program. A trainer qualified to teach the Level III course can also teach the Level II course. There is currently no T-4-T for this course. The QPR for Physicians, Physician Assistants, and Nurse Practitioners is intended to prevent suicide not just among patients, but among colleagues, co-workers, and family members. 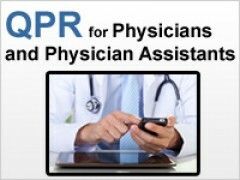 The minimum QPR certificate requires approximately 2+ hours of training. A certificate for the full course requires 6 hours of training and passing a national clinical and content exam. Primary care providers have a high degree of line-of-duty exposure to suicidal behaviors, both in the pre-attempt phase (when suicidal persons are communicating intent and desire to attempt suicide via suicide warning signs), and after a suicide attempt or completion. As health care professionals, PCPs also have higher-than-expected exposures to secondary trauma resulting from suicidal behaviors, particularly in the ED. While perceived comfort and competence in conducting suicide interventions or dealing with suicide events varies considerably, and according to the National Strategy for Suicide Prevention 2012 and 2001, many PCPs have not had specific suicide prevention training that would be beneficial to the health and safety of fellow employees or suicidal patients. The price for the shorter or longer course is the same, and we encourage all learners to complete the full course if possible. The final exam is a national 25-item test that few health care or mental health professionals can pass without completing this course or one like it. As of this writing in 2013, the Institute has trained more than 10,000 Certified Gatekeeper Instructors who have, in turn, trained more than one million gatekeepers worldwide. In addition, thousands of clinical health care providers have been trained in how to detect, assess, and manage suicidal consumers. If this sounds like an "army" of people helping to prevent suicide, it is. Now, with your help, we will create a new division in that army of educated, trained primary care professionals to help prevent suicide around the globe. The primary mission of the QPR Institute has been to provide technology transfer of evidence-based knowledge into useful skills and helpful interventions for those wishing to assist suicidal persons. To this end, the Institute has developed comprehensive training programs to address the training deficits among clinical providers as outlined in the National Strategy for Suicide Prevention 2012, and to provide customized suicide prevention training to match the service setting and the levels of duty professionals in those settings have for the health safety of those they serve. By completing all 6 hours of training learners may earn the "QPR for Primary Care Providers Certificate in Suicide Prevention." The fee is the same for the shorter and the longer course. Two certificates are available.